MARIA FELIX PADINJAREKUTTE (1998) Born at Madappally in Changanachery diocese on 17th June 1920 and professed on 8th December 1942. She was born as the sixth child of Joseph and Theresa Padinjarekuttu. On 20th February 1939 she came to Cannanore and became the First Indian to join the Ursulines. She pronounced her first vows taking the beautiful name” Felix.” Her final commitment was made on 8th December 1945 in Payyanure, Punchkad. Her life story is the history of more than half a century of the Ursuline presence in India. Her entire life was dedicated to the poor and the needy in different parts of our country. With her capacity for architectural and engineering works, she supervised the construction of some of our convents and Institutions. There was no question of self when some thing has to be done for the congregation. Yet she took keen interest in the welfare of others. Her extreme concern in the affairs of the congregation is revealed in all her actions. Just a few hours before her death she enquired whether every thing was ready for the blessing of the new house at Chelavoor. Sr. Felix took time and trouble to visit the houses of the poor, listened to them, comforted them in her own unique way. Her docility to the will of God expressed through submission to the superiors was exemplary. She had a great devotion to the Blessed Sacrament and spent all possible hours before the Lord. She had a habit of visiting the novices, at Cannanore, when ever some important work was being done, to remind them to spend extra time before the Eucharistic Lord for the successful completion of the work on hand. This loving sister used to reward them with ground nuts ! It was her practice to pray for vocations to the priesthood and to support them with prayers. She had a great desire to see the Congregation spread all over in India. Her good example and spiritual influence brought 12 vocations to the Congregation from among her relatives.! She was noted for her deep spirit of faith and Divine Providence never failed her. Along with the Italian Pioneers, she shared and suffered all the initial hardships to establish the Ursuline mission in India. Sr. Felix was active till the last year of her life. Then she had a fall on Good Friday and was admitted in the hospital first iat Cannanore and then at Marikunnu. She had heart problems as well. She seemed to have a premonition of the approaching end. She expressed her desire to be buried at Cannanore with the pioneers and asked for the presence of her spiritual son Fr. K.T. Mathew at her funeral. Naturally both her wishes were gladly complied with. Sr. Felix went heaven to receive the crown of glory on 22nd April 1998. 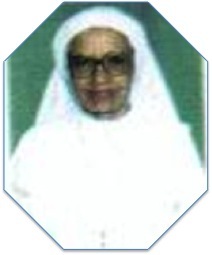 MARIA JOSEPHINE GONZALVES (2002) Sr. Josephine was born on 14 February 1913 at Bolghatty in Vijayapuram diocese, Ernakulam district. She joined the our Ursuline Congregation on 2nd January 1940 as the second indigenous vocation. She was professed on 8th December 1942 with Sr. Felix and committed herself completely to God on 8th December 1945. Her services extended far and wide through the different communities of our congregation. 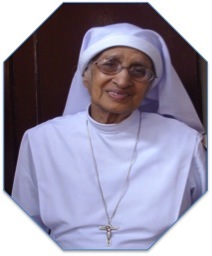 Sr. Josephine played a very important role in establishing the Congregation in India. In the initial stages of its growth and development, along with the Pioneers, she endured a lot of difficulties and hardships. Imbibing the spirit and Charism of the Foundress, Brigida Morello of Jesus, directly from the Pioneers, she was always ready and willing to hand it down to the younger generations through her exemplary life. She was a mother to the orphans of Punchakad and Mattul and the babies in the Creche in Wellington. She kept a soft corner in her heart for the little ones irrespective of whether they were orphans or Boarders. She also lent strong support to the weak and helpless especially the needy women. She always appeared happy and had a gentle and loving disposition. To quote her own words, ”I have not done any great things but I have the satisfaction and joy of knowing that I have done small things with great love and I feel content.” Due to old age and ill health, from 1998 onwards Sr. Josephine was leading a retired life at Chelavoor and spent most of her time in prayer. She used to offer special prayers for priests and missionaries. It was her great desire to have a sudden death without giving any trouble to any body and God fulfilled her desire by calling her unexpectedly. As usual, on 26th January 2002, Sr. Josephine came to the refectory for breakfast. When she had almost finished it, she complained of severe back pain. Before we could get any medical aid, on the wings of a massive heart attack, Sr. Josephine’s soul flew to heaven. Jesus had answered her prayer for a sudden death. Sr. Josephine’s mortal remains found their last resting place at Holy Redeemer Church Cemetery at Marikunnu, Calicut. Maria Aloysia Vaz Born on 25th July 1920 at Mangalore, first of five children of Louiz Vaz and Julie Vaz. Her three Sisters and a brother have already gone to heaven. Mother Aloysia cherishes the love of her nephews and nieces, who keep in touch with her and love her. 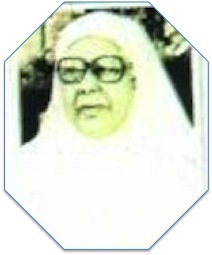 Mother Aloysia made her profession, at Payyanur, on 16th July 1943, during the Second World War. Mother Xavier had been her Novice Mistress. She shared the difficulties and hardships of the Italian Pioneers and of the first Indian Novices. After her Profession she served the orphans at Payyanur. I, Sr. Giovanna Alberoni, remember how impressed I was when, a few days after my arrival in India, I was taken to visit our convent at Payyanur where Mother Aloysia was residing along with Mother Adelaide. How poor and simple was their house! Both she and Mother Adelaide slept in curtained cubicles in the same hall as the Orphans! When she joined, Mother Aloysia had completed her Intermediate Classes. She was not keen on obtaining a degree, but, out of obedience, accepted to continue her studies at St. Agnes College, Mangalore. She obtained her BA in 1952 (?) and was transferred to the Northern mission where a convent had been founded in 1953. She taught at St. Aloysius’ School, belonging to the Parish of St. Patrick at Kanpur. Was a very good teacher, loved by the Students and their Parents. From then on, she was given responsible tasks and so she was Superior of many convents and in charge of many Institutions. In 1961, she was, first time, a delegate to the General Chapter, along with Mother Stefania. Then she was delegated to other General Chapters, and, in 1985, was elected Vicar and resided at Piacenza, Italy, for 6 years. In 1971, she succeeded Mother Stefania as Superior of the Indian Mission, raised to a Delegation. Mother Aloysia is a fervent religious, fully dedicated to serve God and His people in every task and everywhere. She is gifted with a gentle, kind and compassionate disposition, along with keen intelligence and much common sense, so that all the Sisters look up to her and trust her. No selfish streak in her! At present, 2012, at 92 years of age, she is physically weak and moves with the help of a walker, but her mind is as clear as it ever was. Very observant and a lover of the Institute and of the Foundress, she is present at all the activities of the Community, at our Ursuline Convent, Payyambalam, Kannur, the Mother-House of the Indian Mission.